Well, it's been a busy few days so I've combined days 2 and 3. I was lucky enough to win tickets to StyleXL on from Leah's blog Just Me Leah so on Saturday I scampered on up to Leicester. I'll write up my day in a separate post but in the meantime, here's what I decided to wear. I opted for one of my favourite Joe Browns dresses from Simply Be. I've had this a few years now and it's seen me through quite a few parties. It's slightly big on the top half though, so I should probably have sized down. But it's a longer length and very comfy! 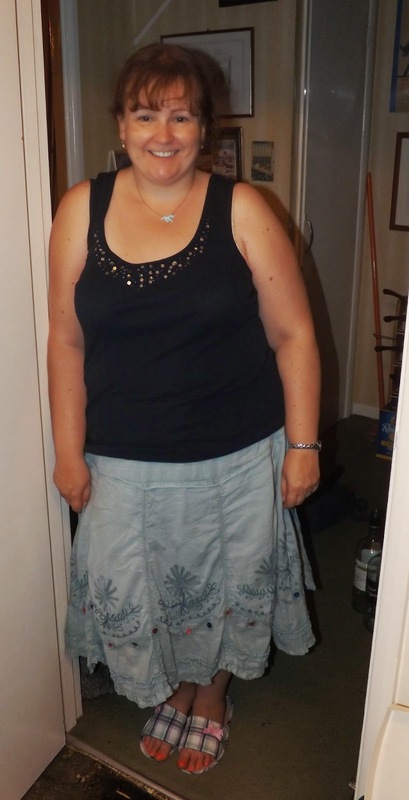 Today was a lazy day after going to and from Leicester so a casual vest from Marks & Spencer teamed with a very old Joe Browns skirt from Simply Be. The skirt originally came with bead and sequins, which I'm not a fan of. And true to form, I was finding that where ever I went - I left a trail of beads behind. So I decided to replace them all with some cheap colourful buttons from my local Hobbycraft store. I think they look prety good and I haven't lost one yet! Outfit August day 28 - a pretty flouncy dress! Outfit August day 10 and being a bit silly! Outfit August day 9 & My Little Pony!